Ian Moy grew up in the surfing culture of Sawtell and Coffs Harbour in the 70’s. 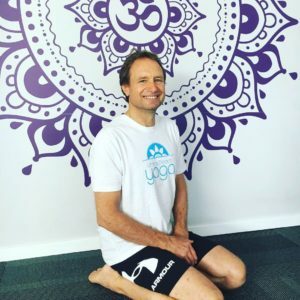 After 20 years of business, he established an organic farm near Braidwood on the NSW Southern tablelands, which he sold in 2014 to complete his Yoga Teacher training with Dru Australia. Ian has a strong interest in growing and eating healthy natural food to keep our mind and body nourished, recently exploring the benefits to our gut health of eating fermented foods. He grows 30 – 40% of his own food in a small space at home. Ian believes as we start to age and mature, it is important to maintain our fitness and nutrition in order to stay healthy. Yoga and meditation are an excellent way to achieve this, and in his classes, you will be introduced to a gentle flowing form of yoga that when practiced over a period of time, becomes very powerful for your mind and body.